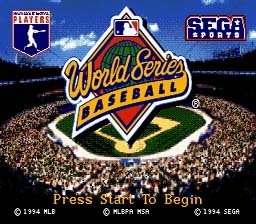 Play World Series Baseball Now! World Series Baseball is a lot of fun to play. It simulates a World Series Baseball game. The graphics look very good. The controls were not very good though. When I played, my pitcher didn't have the ability to throw a ball that went straight, he just had curveball, slider, and sinker. I also found it hard to throw the ball to the correct base while in the feild. As far as baseball games go, it was a pretty good game. World Series Baseball is worth a shot if you like sports games. Play the best baseball game you can to defeat your opponent. When you have a power hitter like Griffey or Belle hold down and use your power swing.